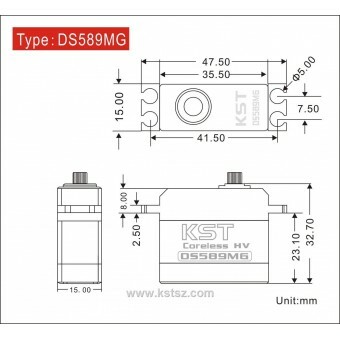 The KST DS-589MG is a high torque, high speed servo in a compact size. Great for flaps on medium/large gliders or on other control surface that require precise control under load. KST improved its geartrain machining tolerances, and this servo is completely slop free, and equal to products costing twice as much. This servo has metal gears, and is very tough. The KST DS-589MG high torque, good speed, and relative small size makes it suitable for many high performance glider, pylon racers and EDF applications. With up to 9.2kg.cm torque the KST DS589MG is appropriate for larger scale glider, and many types of high performance models.